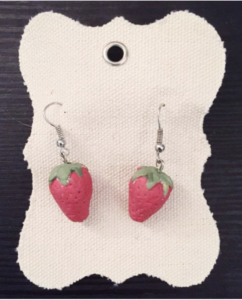 Are you gonna add any more fruit/veg to your earring repertoire soon? I have a few new items coming to my shop this month! As much as I love my food, I’m going to try and branch out to other cute lil miniatures. We will see! How do you make your jewelery n things? Whats the secret process? 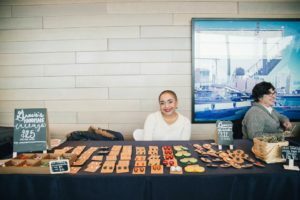 Most things are made from polymer clay, baked, painted, glazed, and then turned into earrings. Other things, like my lemons and my scrabble pieces are made from found miniatures. I do some work with yarn too for the poms and the knitting needles. Do you have one piece that you wear the most? I think I wear my limes or my strawberries most often! Are the cat earrings and pin inspired by a real cat? 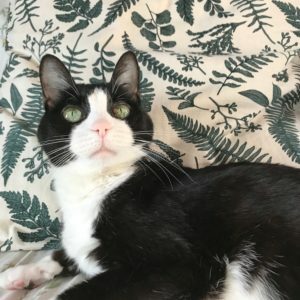 The cat earrings are inspired by my goodest girl of 20 years, Purry. She passed away this July and it’s my way of keeping her alive. Holidays be comin up – which piece do you recommend as the best gift? Everyone loves avocados. And dinosaurs. Heck, just buy them all. Say hey to Grace and sooooo many others this Sunday at the Cambridge Community Center!